Joyelle Brandt: Kindness Mama: Valentine's Love Bombing! 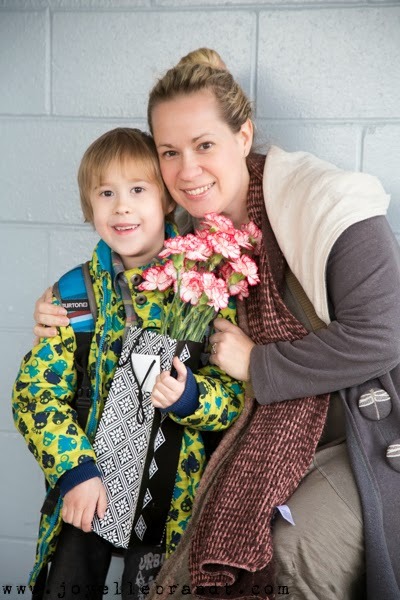 Kindness Mama: Valentine's Love Bombing! I know it has been a while since my last kindness mama post. And here is why: I've been using all my kindness mama energy on myself. In the late fall I felt the oppression of postpartum depression lifting, allowing some joy and light back into my life. And then we had a loooooong string of constant sickness come through the house, as I know many of you have experienced this winter. That set me back quite a bit. And I started letting things go. I started doing less because I just didn't have the energy to keep going. Since I am always telling you about the importance of self care, and since I do claim that as one of my top 5 values, I thought I should take my own advice. And as the days are getting longer, I feel the light returning again, both literally and figuratively. I feel again that lovely joy of connection with my family and a returning peace in my heart. I am so grateful to feel these things again. So last week I wanted to spread a bit of that joy during our annual Valentine's Love Fest. Each year for the past three years, I have bought flowers to give away on V Day. My son Gabriel loves to help with this one! He gets all shy and wants me to do the talking, but he loves handing out the flowers. Sometimes we choose to give them out to random strangers at the shopping centre, but this year we chose his school as the location for our love bombing. We arrived at school a bit early so we could hand out carnations to all the school staff, from the teachers to the janitor. We talked about how good it is to "fill someone's bucket" with an act of kindness. And we made a lot of people smile. Later in the day I was stopping by the arts centre to pick up some paintings that had been on display and I brought some roses to continue the love, because it's really kind of addictive once you get started! I got to have some lovely conversation with a fellow artist, and got the good news that both of my paintings had sold! So life is good here, all around. You are such a beautiful person!